Info "Move the bar by twisting the dial. Don’t let the ball get past you! 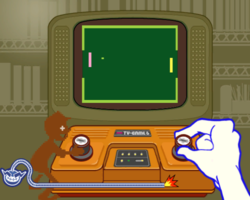 1977: Light Tennis / Color TV - Game 6"
Light Tennis is one of 9-Volt and 18-Volt's Microgames in WarioWare: Smooth Moves. It uses one of the Pong variants in Color TV Game 6, a Japan-only home console released in 1977. The object is to protect the goal by twisting the knob clockwise or counterclockwise to move the bat up and down, respectively. If the player scores the opponent's goal, they automatically win. Level 1: The goals are small. Level 2: The goals are screen-wide. Level 3: Same as level 2, but there is a wall in the center. This page was last edited on February 20, 2018, at 16:43.